The ImageCLEF medical task will for the first time organized a workshop outside of Europe; the ImageCLEF meeting is planned at the annual AMIA meeting in the form of a workshop. Posters are still welcome at the CLEF meeting in Valencia. 05.07.2013 Details of the special issue and AMIA weorkshop announced. 26.02.2013 Test data for the compound figure separation and modality classification are available. 25.02.2013 All participants in the medical task can also submit a paper to the CLEF working notes. 15.02.2013 Training data for the compound figure separation are available. 5.02.2013 A special issue will be organized in Computerized Medical Imaging and Graphics on ImageCLEF 2013. 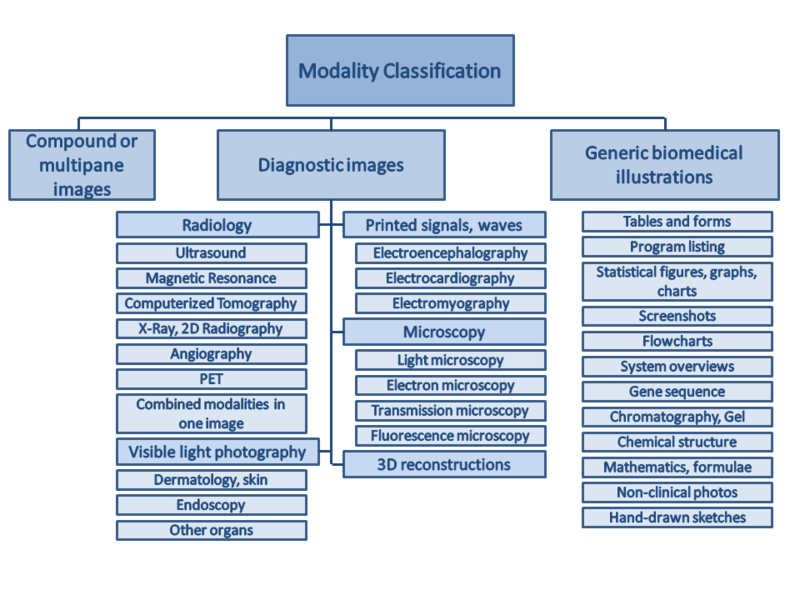 5.02.2013 Training data for the modality classification task has been released. 1.02.2013 The database has been released and also topics for the image-based retrieval. 15.01.2013 The venue of the medical task in 2013 is decided to be the annual AMIA meeting in the US, more details to follow. 12.12.2012 Registration has opened for the medical tasks. The medical retrieval task of ImageCLEF 2013 uses the same subset of PubMed Central containing 305,000 images that was used in 2012. Previous studies have shown that imaging modality is an important aspect of the image for medical retrieval. In user-studies, clinicians have indicated that modality is one of the most important filters that they would like to be able to limit their search by. Many image retrieval websites (Goldminer, Yottalook) allow users to limit the search results to a particular modality. However, this modality is typically extracted from the caption and is often not correct or present. Studies have shown that the modality can be extracted from the image itself using visual features. Additionally, using the modality classification, the search results can be improved significantly. In 2013, a larger number of compound figures will be present making the task significantly harder but corresponding much more to the reality of biomedical journals. As up to 40% of the figures in PubMed Central are compound figures, a major step in making the content of the compound figures accessible is the detection of compound figures and then their separation into sub figures that can subsequently be classified into modalities and made available for research. The task will make available training data with separation labels of the figures, and then a test data set where the labels will be made available after the submission of the results. This is the classic medical retrieval task, similar to those in organized in 2005-2012. Participants will be given a set of 30 textual queries with 2-3 sample images for each query. The queries will be classified into textual, mixed and semantic, based on the methods that are expected to yield the best results. The following hierarchy will be used for the modality classification, different form the classes in ImageCLEF 2011 but the same as in 2012. The login/password for accessing the data is not your personal login/password for the registration system. In the registration system under collections, details, you can find all information on accessing the data. We will provide 30 ad-hoc topics, divided into visual, mixed and semantic topic types. We will also provide 30 case-based topics, where the retrieval unit is a case, not an image. The root element is <annotations>. An Image cannot appear more than once in a single XML results file. All the images of the testset must be contained in the runfile. The resulting XML file MUST validate against the XSD schema that will be provided. This section provides an overview of the evaluation method used for the compound figure separation subtask. The separators don't always match the real size of the subfigures (there may be blank space around them). Therefore, the main metric used for evaluation is the overlap between a candidate subfigure and the ground truth. Overlap ratio is measured with respect to the candidate. In this candidate figure, only one of the 3 subfigures was identified correctly. Indeed, the red subfigure candidate doesn't have an overlap of >=66% with either of the other two subfigures, so it remains an "orphan". Having a single candidate subfigure spanning the whole image will often result in a score of 0.0, since the subfigure won't be contained to >=66% in any of the ground truth subfigures.